Goa may be tiny but it makes up for its size with history, culture and breath taking natural beauty. A dazzling blend of Indian and Portuguese culture, golden sand beaches, swaying palms and mouth watering cuisine, Goa tour packages promise everything you expect from a vacation and so much more. Goa is located on India’s west coast, surround by Maharashtra, Karnataka and the Arabian Sea. A former Portuguese colony, the influence of its colonial rulers will be apparent on your Goa trip in everyday Goan life; from food to dialect to the pretty villas of Old Goa. Goa packages often focus on the popular coastal areas of the state with their lively beaches and impressive villas but the verdant interior of the state is just as beautiful with thick forests, waterfalls and acres of spice plantations. The state is a popular honeymoon destination as well with Goa honeymoon packages offering romantic escapes for newlyweds. Enjoy moonlit walks on the beach, private plunge pools, candlelit dinners by the sea and private tours of plantations on the many bespoke Goa honeymoon packages on offer. Goa packages are famous across the world for three things: sun, sand and spices. 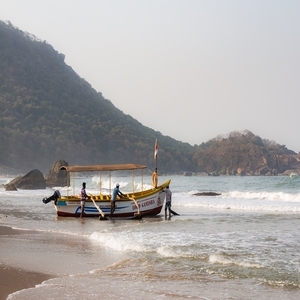 Goan beaches remain the state’s biggest tourist magnet drawing in nearly 4 lakh visitors every year. The beaches in Goa are starkly different from each other with some bursting with seaside shacks and others being pristine and unspoilt. Beaches such as Calangute and Baga are swarming with tourists and activity. If you prefer more tranquil surroundings, we suggest choosing Palolem or Benaulim for your Goa packages and specifically your Goa honeymoon packages. Water sports are available in nearly every beach with parasailing, jet skiing and banana boat riding being favourites. Morjim Beach is a great location for kite surfing and sampling Russian cuisine. Your Goa trip will be incomplete without visiting the iconic cathedrals and churches of Goa. Goa is truly a state of churches, most of which will be a part of your Goa tour packages. The most important of these is the Bom Jesus Basilica, a mainstay of a majority of Goa packages. Built in 1605, this Basilica holds the mortal remains of St. Francis Xavier, one of the patron saints of Goa. The Basilica is built in the Baroque style with wood, stone, gold and granite. It is said that his body has not decomposed in the centuries since his death, no less than a miracle. Every 10 years, his body is put for public display in a silver casket designed in the 17th century, heralding a grand celebration among Goans. Another church of great historical significance that should be part of most Goa packages is the Church of St Francis of Assisi. Built in 1661, the interiors of the church are decorated with painted panels depicting the life of St. Francis of Assisi. The adjoining seminary has been converted into an art museum, which preserves the painting of the saint that was previously kept at the Panaji Secretariat. Not far from the St Francis Church is the Se Cathedral, one of the largest churches in Asia. The Cathedral is dedicated to St. Catherine of Alexandria and took over eighty years to build. The building has a Golden bell that can be heard, it is said, in all of Goa. The temples of Goa, some dating back to the 16th century are also integral parts of Goa tour packages. Do visit the Shri Manguesh Temple in Mangeshi on your Goa trip. This temple is dedicated to Lord Shiva was founded in 1560 and is famous for a Mahashivratri Fair. The temple is located atop a hillock surrounded by dense forests, lending to a surreal experience. Goa has a rich culture and heritage that you will have the opportunity to enjoy first hand with our Goa tour packages. The state has excellent museums, art galleries and libraries including the Goa State Museum, the Kala Academy, the Central Library and the Goa Science Centre in Panaji. In Vasco da Gama, you can find the Naval Aviation Museum, known for its collection of vintage aircraft. Visit Old Goa on our Goa packages to see examples of Christian religious art as well as secular art. The Christian Art Museum and modern art gallery containing the works of surrealist Dom Martin are some of the popular stops on our Goa tours. In Mormugao, you will find the Religious Museum of the Blessed Joseph Vaz. The 1970s saw many artists, painters and architects flock to Goa attracted by the state's bohemian life. Their work is also seen in the scores of galleries and museums they set up. One of these galleries, that is a part of many Goa packages is Subodh Kerkar's art gallery in Candolim. Benaulim also has the Goa Chitra Museum, containing the largest collection of ethnographic artifacts ever assembled in one place. We recommend Gerard da Cunha's architectural museum Houses of Goa in Benaulim, Big Foot (aka Ancestral Goa) at Loutolim, Salcette and Ashvek Vintage World, in Nuvem, Salcette that hosts an interesting collection of vintage automobiles. Scuba Diving is a great addition to Goa honeymoon packages and Goa packages in general. Grande Island, off the Coast of Vasco da Gama has some great dive sites that you would love to explore solo or with your better half. Marine life is abundant, with many species of reef fish, hard and soft corals, and several shipwrecks to explore. Several dive centres dot the area that organise dive trip to nearby Pigeon Island. If you would prefer staying close to shore, try kitesurfing or paragliding on your Goa trip. Morjim Beach has experienced instructors who, with a few lessons, will have you riding the surf in no time. Arambol Beach is a great option if you are in the mood for paragliding on your Goa trip. While you will not find any paragliding schools in Goa, you could enjoy the sport with a companion on our Goa tour packages. Other Goa tourist places that would make for great additions to most Goa tour packages include the Dudhsagar Falls, Anjuna Flea Market, spice plantations and traditional Portuguese villas. Located in the Mandovi River, the Dudhsagar Falls is one of the tallest in India and is made of four separate tiers. The spot is part of the Mollem National Park and is surrounded by dense forest cover and rocky mountains. The cascading falls make for a romantic spot and an amazing addition to Goa honeymoon packages. The flea market at Anjuna Beach is another attraction in Goa that draws tourists and locals alike. Shop for jewellery, trinkets, clothes and souvenirs in this bohemian market. The beach front market is a paradise for the free spirited with handmade clothing, jewels, and even tattoos in the offing; special souvenirs from special Goa tour packages. 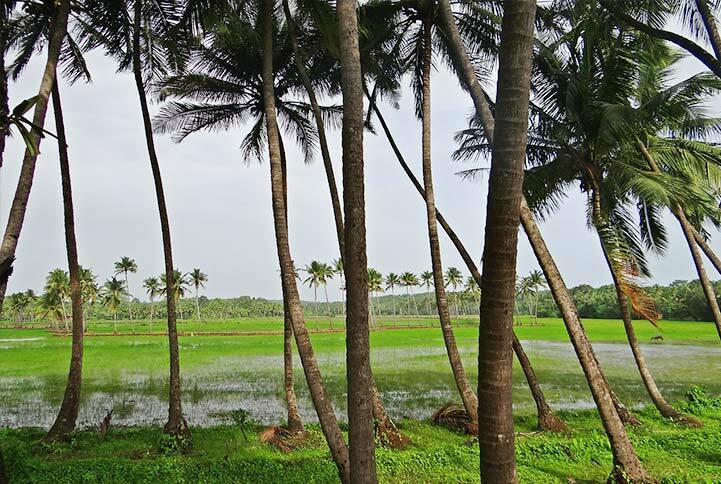 You could also take a tour of one of the spice plantations that are found across the interior of Goa. Take a guided tour of a plantation and learn how pepper, cashew and cardamom is grown. You could also try some feni, a spirit produced from cashews made exclusively in Goa. Goan feni is best relished with traditional Goan cuisine. Enjoyed the world over, Goan food is a delightful mix of Hindu, Muslim and Portuguese influences. Rice, seafood, coconut, vegetables, meat, pork and local spices are some of the main ingredients in Goan cuisine. Watching the sun set while enjoying fried prawns in a shack on the beach is usually the most memorable part of all Goa tour packages.